What many already feared, is becoming reality. 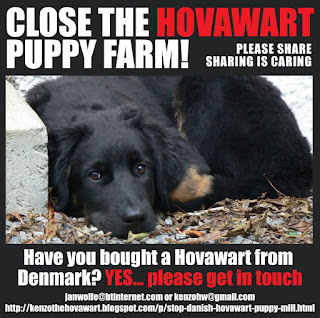 The Danish Hovawart puppy mill is attempting to get back in business, like they did so many times before in the past. The family tried to disappear below the radar, by closing down their main website and leaving a comment they have no desire to continue to breed Hovawarts. In the meantime rumors flourished about dogs that were kept hidden from the original two raids on the puppy mill. Also, the family was allowed to keep some dogs, under the condition they would re-home the dogs themselves. Of course that never happened. "In January it was Christina Thiim that was not allowed to run the operation anymore. It was her that took over in 2008 from her stepfather Torben Weiss when they came in to similar problems. Now they continue again, with Christina's partner as the new owner. The last dogs they promised to hand over we never received. We have to face that we have been fooled." I had a hope that this time it would be the final end of them. You probably did as well, and although it was disheartening to hear the news, it was expected by some, especially the people that are already fighting the puppy mill for more than twenty years. At least we know what we are up against, a family so cold and without remorse, they can relaunch in the blink of an eye and once more parasite on the next generation of innocent dogs. Hard-core animal abusers for own profits, only a sentence and jail-time can stop people like this. "Dyrenes Beskyttelse" is working on an animal neglect case, Rikke Christensen-Lee has already reported the new breeding operation to the police. Many of you reading this are still making an effort I know, by finding purchase papers of dogs they sold after August 2012, which will send them behind bars as well. 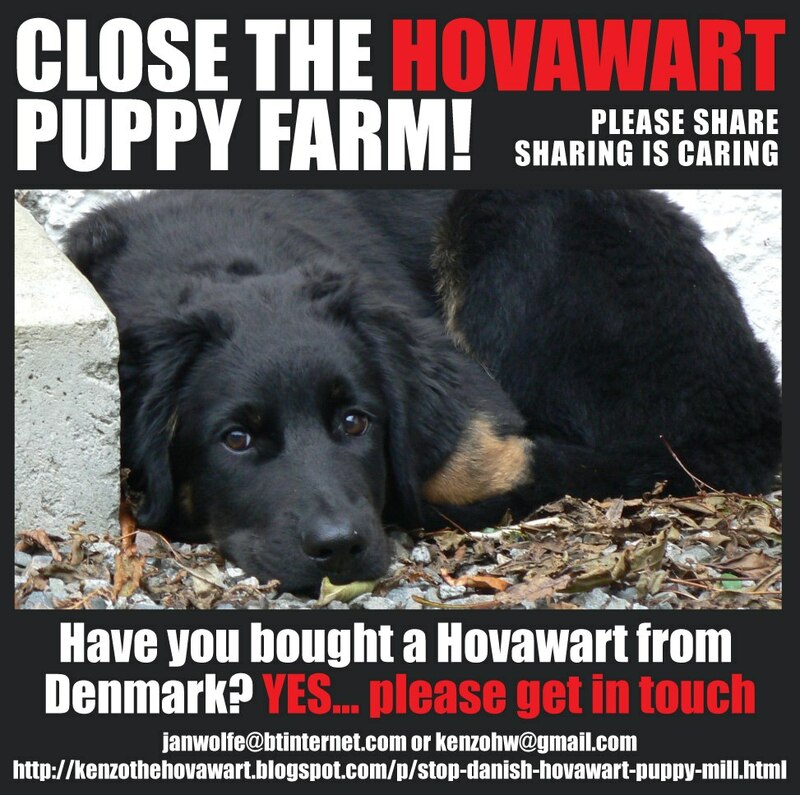 We updated the Facebook campaign and you can help by sharing this page and we are also running google adds to find buyers - see the Danish version on the right. The Danish Kennel Club has now also joined the fight, and are investigating the role of the Police's vet, which role is dubious to say the least. The club is also more actively bringing news out towards their members. Papers are still writing and journalists still listening. And that is also what is different this time. We are all still here, committed to make this stop. They can't fool us this time. Stay tuned. Stay on their tail, Kenzo! Too damned right it is different this time! This is utterly frustrating, but thank-you for staying on the story. Keep exposing the bad guys, Leo - it's so important that the corruption ends. You keep up the good work and stay on their tail too. Have a terrific Tuesday. Good job. They can do their best but now that people are aware, they won't get away with it as they have in the past. The world is watching now and it won't be so easy.